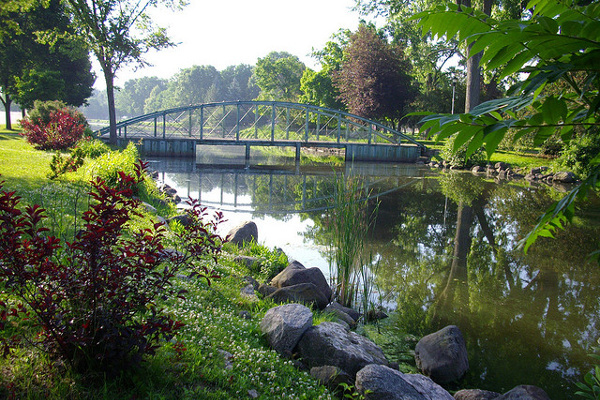 The southern tip of Lake Winnebago offers many memorable pleasures in the friendly community of Fond du Lac. Spend the morning at the 400-acre Lakeside Park and enjoy a magnificent view from the 40-foot high observation deck of the lighthouse. This is an ideal setting for a group photo! From the park drive up the east shore of Lake Winnebago to Columbia Park where you'll find the Calumet Harbor Light Tower with a 75-foot high observation deck that served as a navigational aid. Time for an ice cream break at LaClare Farms - a one-of-a-kind dairy and creamery. If you're lucky enough to find yourself there at lunchtime, their Café offers a seasonal made-from-scratch menu featuring locally raised, fresh ingredients. The Farm has a state-of-the-art facility where they milk 400 goats a day at 4:30pm. Be sure to sample the goat cheese! Travel east through Chilton to Manitowoc. There you'll explore the depths of Wisconsin Maritime history and experience life aboard a WWII submarine at the Wisconsin Maritime Museum. After an afternoon in this picturesque Lake Michigan coastal city, head back to Fond du Lac for some rest at one of our many fine hotels. We're happy to research rates and availability for you. Dine at Sunset on the Water Grill & Bar located on the southern shore of Lake Winnebago. As the name promises, you will be treated to a beautiful sunset! Start your morning at Schreiner's Restaurant, Bakery and Bernie's Pub with famous scratch-prepared food in a casual and friendly atmosphere. Then it's back up the east shore where you can travel on Lake Shore Drive. It's a beautiful lake country road that will take you north into Stockbridge. Continue to High Cliff State Park with spectacular views, underground caves and mysterious effigy mounds. If your group is adventurous, explore examples of Wisconsin geology at the Ledge View Nature Center with three caves formed by an ancient groundwater and glacial meltwater. Travel through Menasha to Neenah into Appleton. Referred to as the Fox Cities, this area is known as Wisconsin's Shopping Place. Take time to discover the Fox River Mall with over 180 stores and restaurants - or continue south to Oshkosh's Prime Outlet Mall for wonderful outlet shopping options. Return to Fond du Lac for a relaxing break before dinner at Jim and Linda's Lakeview Supper Club. This truly Wisconsin supper club offers a four-course meal with spectacular views of the lake. Finish the meal with a specialty ice cream drink - a Brandy Alexander or Grasshopper! Rest well!